Our inspiration for this project was the challenge presented by JPMorgan. We felt immediately drawn to this challenge because we ourselves love computer science and want to inspire others to join the field as well. As most women know, there are many stigmas around the sciences being considered "nerdy" subjects, leading to less 25% of women in STEM jobs. We wanted to present a virtual world where you can literally shatter these stigmas yourself. In our game, you are taken to a futuristic world with exciting music playing with many objects that have descriptions on them. The goal of the game is to destroy all the objects, each of which represents an injustice or a misconception women face every day. We built it mainly using the game development environment Unity with C Sharp scripts to supplement that code and create animations and transformations. We created all of our music using Garageband and some characters in the game were developed in Blender. 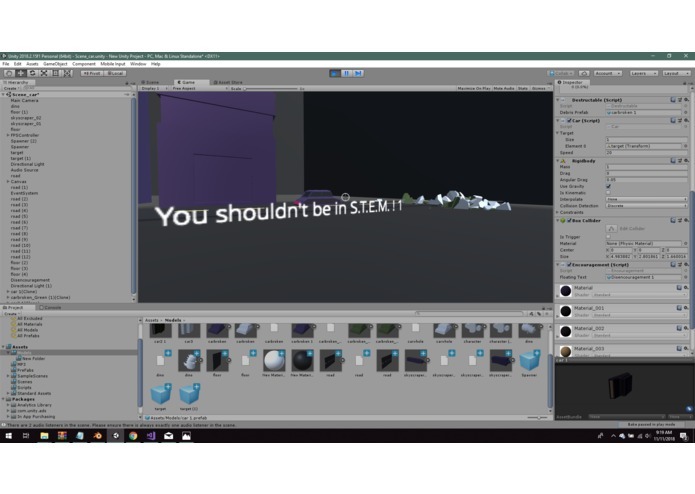 The main challenge was just using the program Unity, seeing as only one of our group members had prior experience developing in it. We are all CSA students, but we don't really have much experience in Hackathons or languages other than Java. However, after many youtube videos and online tutorials, we were able to create a game we are all really proud of. We are really proud of how we learned how to use Unity as a group and how we were able to make an awesome game that we hope will inspire others to shatter unfair stigmas or double standards in their own lives. We learned so much, as mentioned before, about Unity and how C sharp files can create transformations to game objects. We also were able to talk to some great mentors and get some really great advice as to how to make our passions into a career in the future. What's next for Destroying the Patriarchy! We initially wanted to close the game out with the player closing a door labeled "Close the Wage Gap" to have a more conclusive and cohesive ending to the game, however because of time constraints, we were not able to add that aspect in. 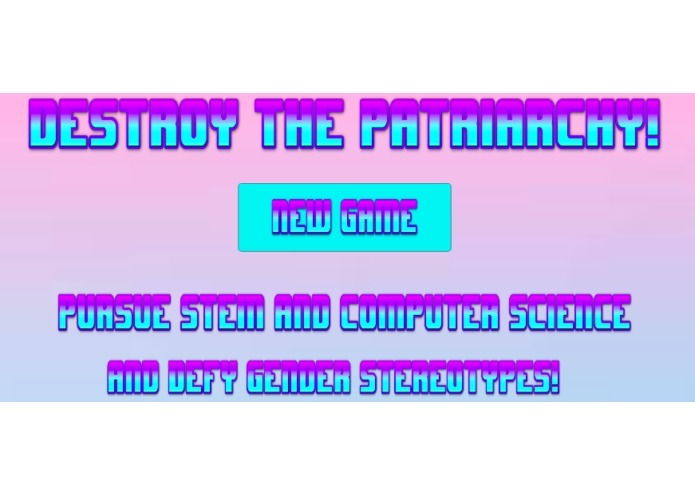 I know we will all keep playing with Unity in the future, so maybe one day we'll create a Destroying the Patriarchy! 2.0 .